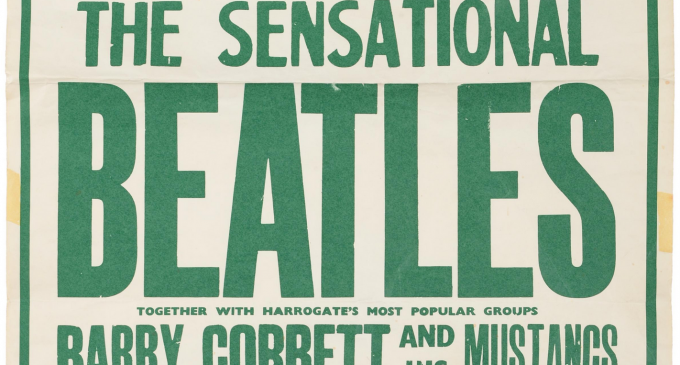 A RARE poster advertising a concert staged by The Beatles in North Yorkshire just as they were becoming famous, has attracted a “remarkable” number of bidders at auction.Tennants Auctioneers, in Leyburn, North Yorkshire, say the poster stole the show during its Toys, Models, Collectables and Sporting Items on Friday, July 21, attracting a large amount of bidders in the saleroom and on the internet.The poster, promoting a concert by “The Sensational Beatles” at the Royal Hall in Harrogate far exceeded the estimate price of £1,500 t £2,000, selling for £5,500. The Fab Four had performed in the North Yorkshire spa town on March 8, 1963, just as their career was taking off. Event promoter Derek Arnold had booked the band in December 1962, when they had yet to become a household name. Their first album, Please Me, had not yet been released and full-blown Beatlemania was still some months away. The auction house said vintage advertising was a highpoint of the sale; a collection of vintage enamel advertising signs inspired competitive bidding, also pushing prices way above the estimate. Three lots – all advertising soap – fetched particular interest. Two signs advertising Hudson Soap reached £650 and £600, above the estimated £70 to 120 and a sign advertising Sunlight Soap with ‘£1000 Guarantee of Purity’ sold for £650, above the estimated £100 to 150.